"The illegality of the piece is in part due to the fact that it does not carry any return address information, as required by law, as well as it violates several other State and possible Federal statutes. The FPPC requires that all campaigns literature carry a statement which discloses the source of the expenditures for the item. It is also a requirement that the name of the committee (or individual acting as a committee) appear on the mailer, as well as a statement indicating its' association with any campaign." So Susan Henderson, who was summarily fired from her job as the Executive Director of the California State Democratic Party in the 1990s for fraudulently impersonating a University of California educated attorney (link), has now shared with us her unlearned interpretation of campaign finance law. So how do you explain the legal deficiencies of the "Yes On Measure UUT" postcard that many Sierra Madre residents received in the mail yesterday? As you can see, there isn't any return address information on this card. Making it illegal per Susan Henderson. But what could be far more troubling is that it's impossible to verify the Fair Political Practices Commission (FPPC) number given on this postcard for a "Yes On Measure UUT Committee" on any government site. The ID #136498 given is certainly not found the FPPC website, and therefore has to be suspected of being either a fabrication or perhaps even an out and out forgery. The celebrated neo-attorney H. Susan Henderson says these things are required by the FPPC and "several other State and possible Federal statutes" for a card like this. And a failure to do so could cost the perpetrators $5,000 per violation. So what gives? 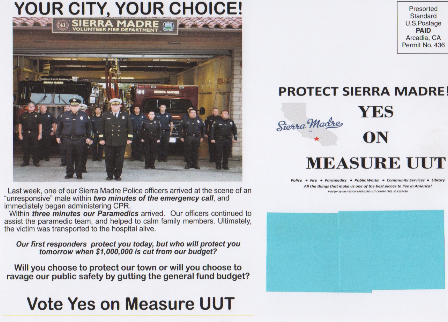 But where this bogus "Yes On UUT" card could have run afoul of the law is in the misuse of photographic images of uniformed Sierra Madre Police and Fire Department personnel to peddle somebody's personal and political tax agenda on a postcard. 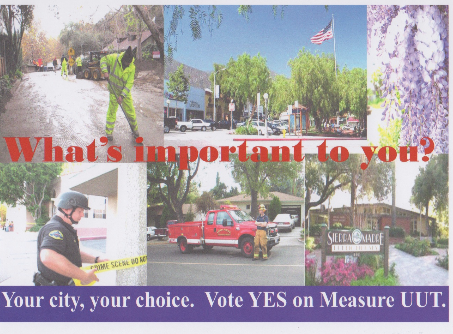 Additionally, the use of images of Sierra Madre government buildings and signage here is also a violation of campaign law as it makes it appear that our city government has taken sides in Tuesday's election, and is using uniformed SMPD and SMFD as postcard models in this effort. Got a postcard today with on-duty photos of police officers in uniform, a police officer must be off duty when engaging in political activities in the state of California. In addition, a police officer must be out of uniform before participating in political meetings or functions. A police officer may not wear her uniform while campaigning for public office or while supporting a political candidate. A police officer also cannot be forced to participate in politics. In other words, this "Yes On UUT" postcard could be an illegal effort to give the appearance that the Police and Fire Departments have endorsed Measure UUT.. No address, a possibly forged FPPC number, and an utterly disrespectful and possibly unlawful exploitation of our uniformed officers and firefighters. It seems entirely conceivable to me that this illegal "Yes On UUT" postcard is at least in part the product of the Mountain Views News. Besides, who else but the literacy challenged H. Susan Henderson could have invented a phrase as bizarre as "ravage our public safety?" Here are some questions. Did Chief Giannone and Chief Heydorff get a call from anyone asking permission to use their fully uniformed images on this political postcard? Did they give their permission to that person? Was anything signed? Were they also asked if the images of fully uniformed officers and firefighters under their respective commands could be used for a decidedly political purpose? Personally I can't imagine that either of the Chiefs was pleased to see their pictures used as part of so inept, shoddy and possibly illegal political stunt. Plus wasn't the picture of our Police and Firefighters standing at attention taken at the most recent 9-11 commemoration at the Fire House? Is that how the photographic record of this ceremony is supposed to be used? As eye candy on an illegal politically driven postcard designed to help push a utility tax hike during an election cycle? Was City Manager Elaine Aguilar contacted? It would have taken her permission for whomever to use photos of uniformed City of Sierra Madre emergency services personnel. And even then it could still be a violation of applicable campaign laws, especially if the usage was a political endorsement. Which, since this "Yes On UUT" postcard cites April's Measure UUT tax increase election initiative, it most certainly was. For those who want to get their grubby hands on more of our tax money, apparently nothing is sacred. Or, in this case, maybe not even legal. Despite all of the disingenuous yapping in the pro-tax local press, it is clear that the information contained in the controversial Goss/Green postcard is both accurate and properly sourced. We know this because we had previously researched much of the information used in this card for an article posted on this blog. Whoever put that card out had likely picked up a large portion of their data from The Tattler. You can check some of this out for yourself by clicking here and here. What makes it worse for Gene Goss is that Susan put him into the position of denying on the record that the information on this postcard is true. Which he clearly did for Henderson's MVN article yesterday. This leaves Gene in a vulnerable position because, as the information on that card is both accurate and well sourced, it gives the appearance that he has once again not told the truth. I know that some people are upset about the Goss-Green card, but I am not. We have had too much dishonesty at City Hall. This has been going on for years, and the consequences have cost the city's taxpayers millions of dollars. This needed to be called out. We do this town no favors when we allow such people to get away with fibbing to the taxpayers. It is delusional to think otherwise. Just like it would be a complete abrogation of our duties as citizens to not call out this "Yes On UUT" postcard as we have done here today. Whoever put the Goss/Green card out, thank you. I only wish more people were as dedicated to truth telling and democracy as you appear to be. I thought the card was put out by smpd until I found the teeny tiny reference to the group that may not exist. This is why you don't use your uniform in ads. The chief owes us an apology or a denial. Now. Why would anyone be surprised that the City would be complacent about illegally using images of our police and fire departments in political ads? They have blatantly used city resources to send out so-called fact sheets about the UUT measure and I suspect judging from the yard signs on the lawns of city employees, that employees have been threatened with lay-offs if the measure doesn't pass. Coercion?, you bet. Susan, Coburn, Walsh, Green, and Goss, and the Reston of the Yes on UUT crowd are getting desperate and you can tell because of the screeching they are doing In their articles and mailers. They have spent this entire campaign Playing catch up and being reactionary. The only argument they have is one based on pure emotion, not reason or fact. thank you Mod, and whoever sent that Goss truth mailer out, for exposing these people for the liars they are. Giannone and Heydorff need to issue statements denying any connection to this clearly illegal postcard. Giannone needs to launch an investigation now. He sure does 6:35 This is very, very bad. What has happened to Sierra Madre? What has happened! Giannone and Heydorff need to put the forces on a diet and work out program, judging by the picture on the postcard. The Chief should set an example and start an exercise regiment for the police department. The only raise the Sierra Madre Police Department needs is a membership to the gym. The Fire Department being that it is volunteer force, may be a little different but a few of the members might also consider joining the Chief. What happened to minimums in physical fitness? 11:04 - The nursing home incident had only one officer involved with drawing his gun: Ed Delcoure. He was reprimanded (cannot remember if he was suspended or not) and the story was in the Sierra Madre Weekly. Once again, the police and fire department are being used to play on the sympathies of residents in order to pass a tax increase - its the usual scare tactics. However, because the police and fire department are usually the primary beneficiaries of these taxes, they must be considered as suspect or complicit in the mailing. Don't underestimate what the unions will do to take more money from the taxpayers. If I recall correctly, the SMPA at one time used one of the worst, most dishonest law firms that ever existed: Lackie, Dammeier, McGill and Ethir. They were the police union lawyers who disbanded after being raided by the Orange County DA in a criminal probe. It doesn't get any worse then those guys and the tactics they used to get their way. The fact that the SMPA decided to associate with these bad people tells you all you want to know about their motivations and tactics. With Goss associating with Yolanda Miranda and the police and fire perhaps involved in trying to influence the outcome of the UUT vote, we can see how corruption has come to Sierra Madre. hopefully this is the last election we'll have the Henderson/Walsh/Buchanan parade of candidates and have low level choices like Goss and Green. If Green gets elected maybe he'll recoil against Walsh and Henderson who used his ego and naive mindset to convince he was a sure winner and screwed him over royally but he appears a loyal lap dog to Susan Henderson who is bascially a nobody in town - just bullys her way around. 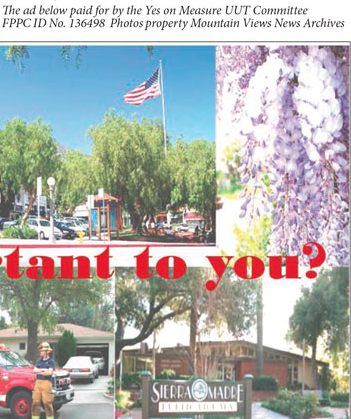 Susan's blatant misuse of photos of city personnel and city property should, at the very least, be dealt with by taking away her status as the "adjudicated newspaper of record" for Sierra Madre. to allow her to continue to receive income from this is tantamount to a political payout to her from the city. Sierra Madre is corrupt. This all stinks to high heavens. The reason all that bad stuff came out about Susan in 1995 was that the people who worked for her at the CA Dem Party all hated her guts. She was a tyrant and a bully. That stuff was leaked by her underlings and out the cistern she went. The only person that stuck with her was Bill Press. Many thought Susan must have had pictures. This mailer smells like its coming from or being paid by the police union. Far from being exploited by the Yes on UUT crowd, the police and fire have the most to gain from the passage of the UUT. Because people are on to to the fact that all these unions care about are taking money out of the pockets of the taxpayers so that these people can retire at 50 with lifetime pension, cost of living increases and full medical benefits, they not have to be more discreet in how they elect their candidates and get more taxes past. Overt support from the unions has become the kiss of death because most residents know the union's real motivations. It is shocking that these DIRTS can do these things, year after year. When are the people of this town going to wake up. This group of town gadabouts are dishonest and some are criminals. They are all payed off and some of the dishonest money comes from our tax dollars!!!!! As I looked at the post card yesterday, the one person that came to mind was Miz Henderson. Who else could put forth such lies? Unless it was sent out by Elaine and her staff. Putting forth pictures of what we are in danger of losing by not giving the city more tax money to waste. The laughing matter of it all was the picture of the wistria flower....are we going to lose them also? The Goss and Green campaigns should release details of what exactly was false about the Goss-Green mailer. From sources readily available as well as their public appearances, it seems the mailer was true. Especially Noah. Let's see proof he cast votes for the 2012 city, June 2012 state primary & 2012 Presidential election. He may have voted, but not in Sierra Madre? I don't understand why a group of people would spend the money to send out these cards defending a tax increase that no one I know wants or thinks is fair or needed at this time? I donated money to the NO on UUT card that was sent out, because I feel strongly about this issue. They do not need to raise our taxes anymore! It is obviously just for the city employees to get bigger raises and benefits, and they already make more than most of the residents. Henderson lies, Goss lies, Green is not from this planet. Quite a team they got working the streets. That was the point. When that picture appeared in the MVN Henderson referred to Buchanan as Zimmerman. It is a screen shot. That's a relief, Mod. I thought Kurt looked really bad in that picture. I can't ever remember Kurt rocking one of Johnny B's tang colored badger cuts. Please, Kurt Zimmerman is a hero. Buchanan is a scoundrel at best, a crook at worst. I guess we won't be seeing anything from Coburn today about the UUT crook card. He is to busy holding a pity party for his pal Goose. The FPPC number for the Yes on Measure UUT committee is 1364958. So it seems the FPPC number on this card is identical except for the missing numeral 5.
political activities of any kind while in uniform." Compare the indicia information "Arcadia, CA Permit No. 435" on this Yes on Measure UUT piece to the indica on Gene Goss' or Noah Green's mail. The incorrect FPPC number is given both on the card and in the cover article of the Mountain Views News yesterday. Had to have been the same person. I think in the detective world that is called a match. Really? The same wrong FPPC number is on the UUT card and in Susan's paper? Oh, that is classic! Famous Amos says: Shoot first! Ask questions later. But only with an attorney present. FPPC numbers are not required to be disclosed however Committee names and addresses are required to be disclosed once the committee has raised more than $1,000. What about printing incorrect FPPC information on a political mailing? Noah Green put the wrong FPPC number on his yard sign. The one where he misspelled the word "campain." My take is they're all smoking out of the same baggie. That picture was taken in 2010. They're all gone from the City Council now. I call that a victory. Watch it, 9:02. Mayor Nancy Walsh is in power thru 4/22. She'll take you out. Hopefully Nancy's going away present from the FPPC will be about $15,000 in fines. You can't take that out of the General Fund! The Arcadia, CA mailing permit used to send this Yes on Measure UUT mail out is the same permit being used to send out Gene Goss mail. Goss' mail was produced by "The Workshop" located at 407 N. Second Ave., Arcadia, CA 91006. Well, now there is a surprise. Let me guess, the Yes On UUT Committee's treasurer is Yolanda Miranda. This is so confusing! Who do believe? And what do confused voters do? So the adjudicated paper is running the campaign in support of a tax increase desperately sought by the city that selects and pays the adjudicated paper? Thick as thieves, as they say. As the treasurer of the Yes on Measure UUT Committee, it looks like Amy Putnam is going to be fined for authorizing and paying for a mailer without the Committee name or return address. They better raise more money to pay the fine. The Yes on Measure UUT Committee also better report an in-kind contribution from the Mountain Views News for the use of MVN copyrighted photos. Isn't Nancy Walsh's name on the Yes On UUT paperwork as well? Didn't John Harabedian use uniformed officers on one of his campaign postcards as well? Quite a lawless crowd we have running the city right now. It's a Calderon thing. You wouldn't understand. The UUT card has all the patches. Is there any special category of penalties for people who break FPPC campaign law during a tax referendum? Maybe it's time to contact the Attorney General! Welcome to the dark side young Skywalker. why doesn't Henderson endorse candidates in Pasadena, Monrovia, Arcadia or Duarte or give those Councilmembers front page access to political agendas like she does in Sierra Madre? why doesn't she get active with similar tax ballot initiatives like she's been selling the UUT in SM ? she's pretty narrow with her focus only on SM when she sells her ad space as being regional - has any advertisers been shown an actual proof of printing - any printer can provide a notarized statement of actual print run but Susan refuses to provide that. but then again, she does claim to have a law degree doesn't she? 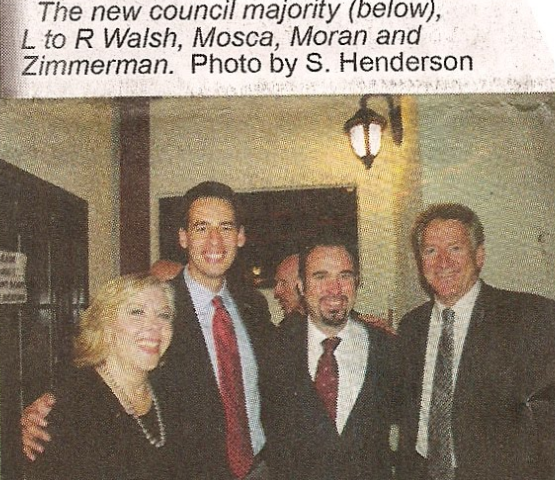 Such a big typo on that first picture with Council Majority. Bet Ms. Henderson didn't make that mistake, I bet it was one of her highly paid proof readers. I'm sure she blamed someone.